In this part we are targeting MySQL cache. 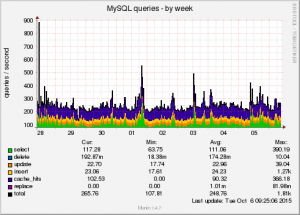 On most of our shared-hosting servers more than 50% of all queries are served by MySQL cache. That means that they are fast, use less CPU and disk IO – something you should never ignore regardless how fast your hardware is. 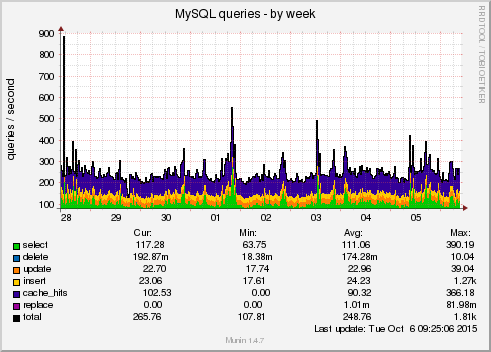 Example of MySQL query stats. Dark-blue is for cache-served queries. There are 4 main configuration options, that are used to control MySQL query cache. query_cache_type – set query cache type. 0 – turn off, 1 – Cache all cacheable query results except for those that begin with SELECT SQL_NO_CACHE; 2 – Cache results only for cacheable queries that begin with SELECT SQL_CACHE. query_cache_limit – Do not cache results that are larger than this number of bytes. The default value is 1MB. query_cache_size – The amount of memory allocated for caching query results. The default value is 0, which disables the query cache. The permissible values are multiples of 1024; other values are rounded down to the nearest multiple. query_cache_min_res_unit – The minimum size (in bytes) for blocks allocated by the query cache. The default value is 4096 (4KB). Tuning information for this variable is given in Section 8.10.3.3, “Query Cache Configuration”. Minimum value is 512. For cache testing I have use same data, as I used in my previous tests. Several big tables, containing 1.7bn records. I have executed very similar queries – first forcing no-cache and then running same queries, but with cache and actually running 10 times more queries to show the speed and power of the MySQL cache. Executed 10 queries using non-indexed join. All cached queries were repeated 10 times more. I have mostly played with query_cache_size and query_cache_min_res_unit settings. Keep in mind, that total number of queries in second column is 10 times more. For our queries the most optimal value for query_cache_min_res_unit is 512. On our system and with out queries most optimal value for query_cache_size is 256M. As you have probably noticed, I run all tests on MyISAM tables, as they are still quite popular. After figuring optimal values for MyISAM I have executed same tests on InnoDB tables and here are test results. Please remember, that even though execution time is very close – we execute 10 times more queries. It is very interesting to see, that same queries on InnoDB run in average 3 times faster, especially, if indexes are properly used.